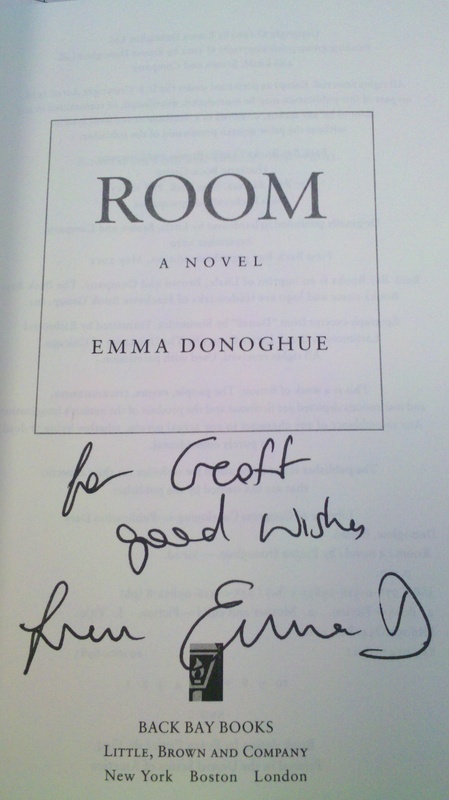 Yesterday I was desperately searching for five copies of Christopher Klein’s Discovering the Boston Harbor Islands for an event we’re having next month when I found out Emma Donoghue, author of Room, was in town doing a reading last night and question and answer session at Harvard Bookstore. Needless to say I was very excited. I have been patiently waiting for Room to come out in paperback for over a year and while my step-mom was visiting this past week she bought me a copy of it. If you haven’t heard of Room, it’s told from the perspective of five-year-old Jack, who is the son of a kidnap victim whose entire universe is one room. The book has gained increasing attention over the past year and won the Irish Book Award and appeared on the shortlist for the Man-Booker prize. Ms. Donoghue was brilliant, she was hilarious and serious and well spoken and had researched all aspects of the book and it made me very excited to actually get the chance to sit down and read the book. But the icing on the cake of living in a big city, is that I found out Marge Piercy will be in town tomorrow night reading from a new book of poetry (The Hunger Moon: New and Selected Poems) at the Brookline Booksmith and needless to say I am very excited and will be going to get my copy of Woman on the Edge of Time autographed as well as a copy for a good friend in the UK. I wrote a paper on Woman on the Edge of Time that caused a bit of hoopla in my department and needless to say it will be interesting to see what she has to say. In case you were wondering, I did find five copies of Klein’s book at the AWESOME Brookline Booksmith.